Since deciding to leave 'civilisation' I hardly much missed the comforts I was luckily blessed with. Lord knows my parents are confuzzled why I chose to go to a country worse off than the one they took me out of! I guess that choice is a luxury they passed on to us, but that's where we see things differently... So instead there's a daily onslaught of novel situations-- sights, smells, tastes-- not all good! But more often than not it's a memory to put in that bottle. Here we saw an old man who lives at the temple on Phnom Chisour (2hrs' motorbike ride from Phnom Penh). 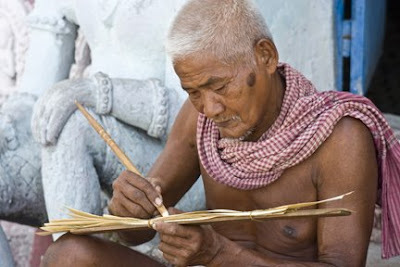 He writes Buddhist teachings on dried banana leaves cut into uniform 'pages', which are then tied together into a 'book'. The implement is a branch with a sharpened end, and he fills in the strokes by rubbing a crushed leaf across the page. One book takes him a week to complete, and this he sells to tourists for $2. The skeptic in me wonders in which part of the pagoda do they mass-produce copies of these little books, and then age them over a fire or something. But as K and my photographer friend traipsed off to shoot all manner of inanimate curiosities, I stayed behind and watched him at length (like for 2hrs) painstakingly scrawl his messages. I even helped him pick leaves for ink (only the young leaves will do). Yes, I bought one book from him. I have no idea what to do with it, so it sits with other dust-collecting ethnic baubles I purchase for the sake of stimulating the local economy.